A new window treatment can make a big difference. If you’re able to make it yourself, even better. Or, you might decide to eliminate the curtains completely. When it comes to getting a new look, our budgets doesn’t always match our aspirations. This is particularly true in a space like the kitchen, which is full of big-ticket items like appliances and cabinetry. A full kitchen renovation runs to tens of thousands of dollars. Don’t be discouraged. With just a few savvy purchases, or a bit of time and creativity, you can give the space an update without breaking the bank. 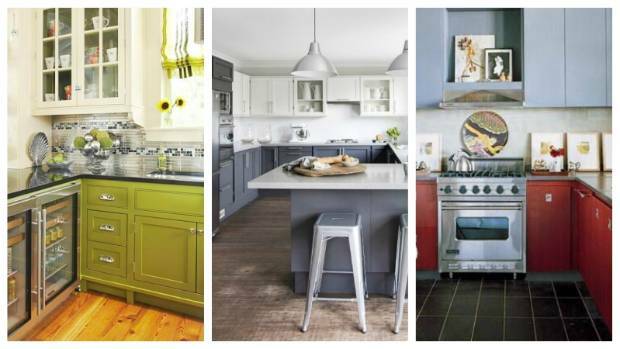 Painting the cabinets takes a bit of time and money, but totally changes the look of your kitchen. Try a two-tone treatment – one colour for the bottom, one for the top. Get rid of old or dated hardware: Arguably the easiest and most affordable upgrade is replacing cabinet knobs and drawer pulls. This quick fix gives a dated kitchen a fresh face-lift. When choosing kitchen hardware, consider your desired outcome. If you want a traditional look, opt for brass. For a sleek and modern look, try a polished nickel finish. Whatever you decide, be sure to take along your existing hardware to the store to ensure the right fit. Paint your timber cabinets: A complete cabinet overhaul is awfully pricey. Instead, give the existing cabinetry a fresh coat of paint. 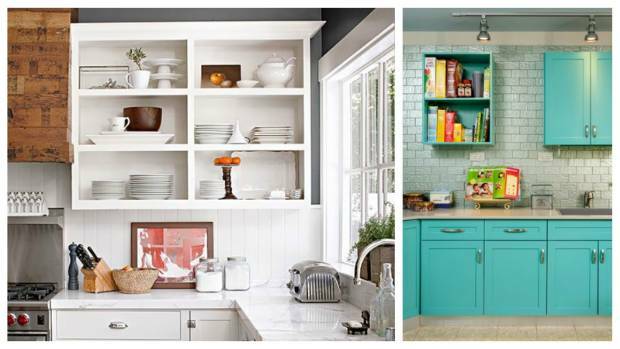 You could try two complementary colours, one for the upper and one for the lower cabinets. Along with painting the cabinets, consider removing the doors to create open shelving. Swap out (or remove) cabinet doors: Replacing existing doors with glass-paneled ones looks like a major upgrade. Opt for frosted glass, if you feel like your shelves aren’t display-worthy. Or, ditch the doors altogether to create the effect of open shelving. Display your favourite dishes and bowls to add a bit of interest to the room, or try a high-impact background colour. Think of small appliances as decorative accessories: An orange fridge might be too bold (and too expensive) for most homeowners. But go bold with everything else: a cobalt toaster, or a cherry red mixer. These things are like jewellery for your kitchen: you can move them around or put them away. Hang window treatments: New curtains can really spruce up a space, and fabric is relatively inexpensive. But think twice about the type of treatment you hang on the window above your sink. You don’t want something with too much fabric that could get ruined from splashing. Go for an option that fits within the window — like a roman shade that you can easily pull up while you’re washing dishes. Forget plain white or stainless. 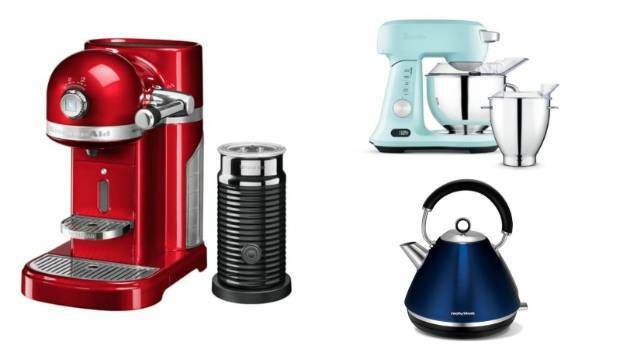 Small appliances come in a rainbow of colours to add a pop to your benchtop. 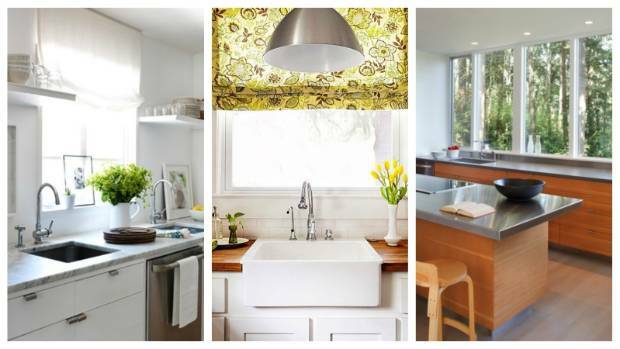 Swap out the splashback: The beauty of the splashback that it’s limited in size. It’s an easy-to-tackle area that won’t break the bank, and there are so many options. Replace the benchtop: This job is less expensive than you think, and it can make ho-hum cabinets look more special. Depending on the size of your kitchen you can get a new laminate surface for a few hundred dollars – and laminates have come a long way since the 1980s. If you’ve got stone, timber or wood benchtops consider having them refinished or polished for a like-new look.